just loved these, especially of her building the nest. i often brush my hair outside, and later on when storms knock out nests I notice the birds here use it to build their nest. i see those blackbirds a lot. didn’t know their name though. it took me a bit, too — especially with the females, who are so different! Thanks so very much! I totally agree, the tiny birds are so very lovely… Nature is a most divine and beautiful thing. I love how nature protects females by making them subdued colors — while making the males targets through their glorious colors. Too funny! Thank you so much!! They really are adorable songbirds. And… *hah*! I’m always cracking up at how nature camouflages the females and brightens the males. So many don’t even realize that these are female blackbirds. We were recently at a sanctuary with free-roaming peacocks (not a totally uncommon thing in Florida neighborhoods), and that observation was just even more hysterical. Female peacocks? Can’t compare to their male counterparts. Beautiful photos! I enjoy your blog so much. You’ve created a window for us into this part of nature. Thanks so very much — that truly is the *utmost* compliment, and is thoroughly encouraging as I drag my camera around on our hikes (in occasionally not the most amenable spaces)! True! What we won’t do for a picture sometimes. I love these birds. They’re an excellent signal that water is nearby, and bodies of water just don’t seem complete without that familiar call. I live near a lake that must have hundreds of them nesting in the cattails along the shore. The birds may be common, but they’re one of my favorites. Ditto!! I adore them, despite their “most abundant” status. It’s amazing and inspiring to see how so many people associate them with water ecosystems, and the [good] feelings that these songbirds/natural spaces provoke. Despite liking them so much, I’ve never bothered to figure out where they nest, so I’m glad you took pictures of that. I’ll have to make sure to look closer to the water line when we walk around the lake. I always see the males up at the top of the cattails, making themselves known, but I suppose that’s precisely why they’re up there. its a nice & a hard work done by you, i appreciate your work, nice collection, i really like your blog. you are amazing …. Beautiful bird! Love the way they make their nests: so tidy and accurate, and actually endurable if you think of it. Thanks! Thanks so much! Their nests are *amazingly* tidy and accurate, you’re exactly right. To see a female blackbird weave her nest is a mesmerizing process… Nature is astonishingly strong. We have a cloud of red-winged blackbirds that live in the marsh by our house. I always know it’s spring when I hear their distinctive call. I’ve even had a couple come visit my bird feeder from time to time. Thanks for highlighting these beautiful creatures. You’re so welcome! It’s amazing it took me this long, honestly… For years I’ve been photographing them, admiring their nests, transfixed by their devotion — they’re such lovely little songbirds. I love birds. I’ve always thought they were such beautiful and adorable creatures (although, when I was younger, I used to hate them with a seething passion). Your photographs are very beautiful and taken well. Your blog is also informative, and I’m happy to learn more about the derfs (read:birds) of the world. Will be following you! Thanks so much! I’m glad the provided info helped… I’m fortunate to live in an area with so many birds (derfs?) — and while I’m primarily a hiker with a camera, a little research helps, as do the insanely knowledgeable Audubon enthusiasts! 🙂 I’m glad you outgrew your hatred of them, lol! Just incredible. The nest photos are my favorite! Such delicacy and strength at the same time. Thanks so very much! What a perfect way of putting it — delicacy and strength. The process and patience of the nests’ construction is amazing, a thoroughly mesmerizing thing to witness, and the end result is simply Nature at Her finest. Beautiful photos – Congrats on being FP! Thank you! I honestly didn’t quite realize what was happening until the inordinate amount of emails hit my inbox, hah! 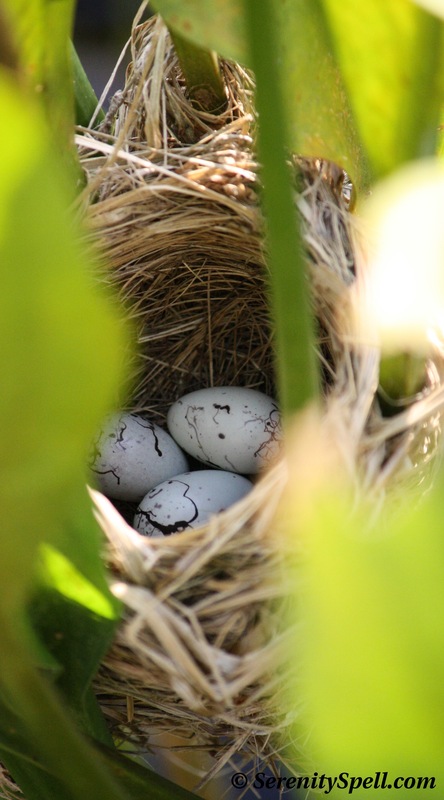 You must have a great deal of patience to be able to get such lovely, intimate shots of a birds’ nest. Loved looking at these. Thanks so very much! We have the other blackbirds as well, and they’re equally stunning with their ebony sheen. Speaking of hopping across the pond… I would change places with you in a HEARTBEAT! Drop EVERYTHING! I just looked at your garden — GASP. My dream. For some reason these birds always swoop down and attack my head when I pass them. Even when I am with a group of people, I get singled out and attacked. It’s odd. But your photographs are incredible. They are ‘National Geographic’ worthy photos! How incredibly kind — thanks so very much! And I’m so sorry… But your story made me guffaw!! Don’t feel alone though; our mockingbirds do the same to me every time I *dare* to leave the house or venture near my car — which is actually quite often, go figure. Each spring they make their nests in our bougainvillea, and each spring it’s the same game…. This tree-hugger is obviously their arch-nemesis. Though a very prolific species in North America, I really love these birds. Your photos also do them justice. Though I am mostly a raptor lover, these are some of my favorite birds and your photos do them justice. Thanks. Thanks so very much! I, too, adore the raptors… They’re tough to photograph without a bigger lens, unfortunately. But it’s hard not to see the beauty in these tiny songbirds. Or any of the critters for that matter — and I try to photograph / post as many as I can, heh! Incredible photos! I, too, look for these birds every spring in a certain swamp in town. Could you share info on the camera and lens that you used? No time to read but I loved the photos! I’ll come back for a read later. Cheers and thanks for the smile I now have on my face! Love your pictures! Thanks for the smile on my face now. Beautiful photos. The blackbird eggs are so pretty. Thanks so very much! The eggs really are amazingly beautiful and varied. I just popped onto your blog — I can’t wait to check it out more; such beautiful work! Beautiful photographs. I love the detail. This was so informative! We recently moved to a place where we have a “swamp” as we affectionately call it in our back yard and we have been watching the males posture and call. Thanks for the up-close shots! Amazing! This is one of my favorite birds. Thanks so much! Don’t feel alone though; our mockingbirds do the same to me every time I *dare* to leave the house or venture near my car — which is actually quite often, go figure. Each spring they make their nests in our bougainvillea, and each spring it’s the same game…. This tree-hugger is obviously their arch-nemesis! They — and your blackbirds — are being extra-territorial over their nesting females. We’re obviously quite dangerous!! I’m amazed at how close you got to these birds! great photographs! Thanks so much! I’m really lucky I’m able to get as close as I do to the males (they’re probably not thrilled about it, but they’re used to it I think)… But the females + their nests are a bit tougher, for sure. Zoooom lens! They are cute little creatures. You’ve got nice photos!! 🙂 I’ve enjoy the post. Keep up the good work! 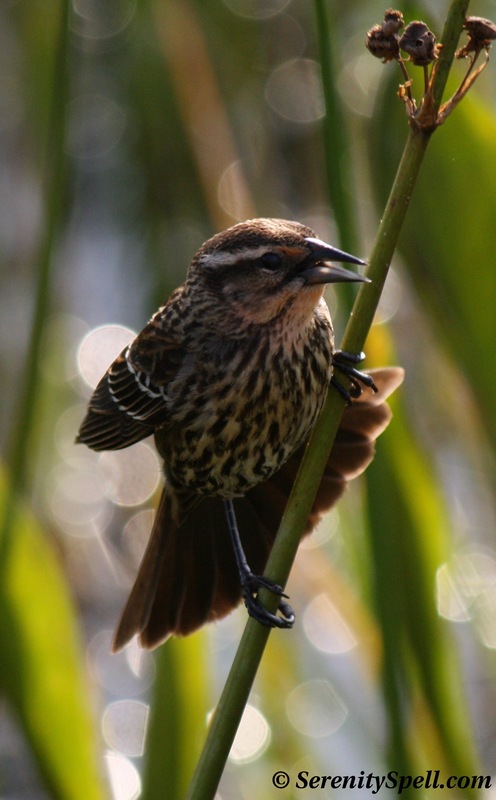 I’ve never seen a female red-winged blackbird so closely before, thank you for the opportunity to get into their secret lives! And the eggs, so amazing! What a wonderful compliment, thank you! They’re surprisingly shy (and tend to stay closer to the water’s edge and surface, or in the vegetation). And the eggs… Aren’t they lovely? I wish I had a clearer shot through the marsh! Wonderful images! Just two weeks ago I saw my first pair at my feeder in Central Virginia. What a thrill! They were just passing through, as do the Cedar Waxwings, therefore I appreciate these birds highly. Please visit my blog and see my novice images from my kitchen this spring. Birds are difficult to photograph, therefore kudos to you! D.
Fantastic shots. I have ever thought about focusing on birds with my photography but after seeing these photos I have a greater appreciation for this genre. Thank you for sharing. Thanks so much! Ditto, I honestly rarely shot birds until recently — I drag my camera everywhere on our hikes, and love the trees and landscapes. The birds began to creep in, go figure! They’re great practice for those action shots, which I’m still learning. These birds live at the pond near my mom’s house in Pennsylvania. I was never able to find their nests but I was always looking in the thin trees where I always saw the males perching. I guess I should look down. Their distinct call is one of my favorite parts of walking around that pond, although my family’s terrier does seem to put them on edge. Just because something’s common doesn’t mean it isn’t pretty. I love to watch pigeons, especially when they have the irridescent feathers, and they’re as common as dirt in NJ. I definitely can’t wait to see their nests. They haven’t returned from the winter yet, I’m hoping they’ll be back when I visit home for summer. We do have an adorable nesting pair of geese and a couple of pairs of ducks. The geese get a little mental when the ducks get too close. Luckily, it’s only two geese, too many of them can foul up a nice area very quickly. Fantastic photos of the “family” – congratulations on being Freshly Pressed! I have redwing blackbirds coming to my feeder but I can’t say I’ve ever seen a female before your photos. Thanks for some really great nature shots. Randomly stumbled upon your blog and loving all your entries! Everyone who’s commented above is right,these pictures are pretty amazing! Awesone photos.. so clear and close… I love the male feather color.. red + black is a nice combination. Fantastic pics. After reading your post, I’m intrigued and want to read more about this bird’s amazing behaviors. I’m definitely an amateur birder but I aspire for greatness. Even in the heart of Chicago, my home, we have a wide array of bird species. Do yunu ever watch cardinals? They’re a favorite of mine. Congrats on being Fresh Pressed!!! Thanks so very much! I’m thrilled that the post has inspired you to delve deeper into this little bird’s nature. 🙂 I don’t think I could even call myself an amateur birder — I love them, and adore photographing them — but I’m lucky to be surrounded by some insanely knowledgeable Audubon enthusiasts! I *adore* cardinals…. We even have them here, in the depths of Florida, near the Everglades! But I haven’t been able to get a great shot of one — they’re quite shy. But they’re totally fascinating birds; how long they can live in the wild, etc. I never would have recognized the female as a red-winged blackbird! And how did you ever get close enough for that shot of the eggs without being chased away? Oh, absolutely, do so!! I used to bring my little camera EVERYWHERE on my hikes… (Now it’s just a bit bigger.) You’d be surprised with what you can capture — their quality is amazing! Ah, you’re in my (former) neck of the woods! I was raised in Micronesia…. No Red-wing Blackbirds there either, hah! Thanks so much for your kind words; they’re apparently the “most abundant” species on this continent, so if you make it over here — you’re bound to see ’em near water! We have a feeder with a cage to deter squirrels. The red tips don’t fit so they wait below while the finches knock seeds on the ground. Teamwork or sloppy finches? Who knows, but it’s fun to watch either way. Heh, I like that!! It’s probably a combination of both, like everything… Teamwork + sloppy songbirds! We have the same tandem relationships here, and you’re right — it’s always fun to watch. The shy buntings will wait, if there’s no room at the feeders, and partake in the overflow below — until they’re scared to the feeder itself. It’s hysterical. Back and forth, and back and forth…. Wonderful pictures! Did you study photography? I especially love the last one where the female is looking down in worried concentration at something below. I used to live near Great Meadows, near Concord, MA – one of the most spiritual places I know. The Great Blue Heron on my twitter profile is from there. Took that with my iphone. 🙂 The setting sun turned the snow filled marsh into a golden corn field and he stood majestically resplendent in the light. I can only imagine how beautifully you would have captured the scene and him. Good Luck and thanks for sharing your gift. What a most lovely and inspiring compliment — I can’t thank you enough for such kind words! We have so many Great Blues in our area (of course, we’re surrounded with swamp) — I adore them! I “don’t do the twitter,” LOL… But I wish I could see your image! I posted some Great Blues nesting, recently. WOW, for such graceful and elegant birds, that’s brutal witness. The chick that’s born first is stronger and more learned in the feeding process — so the younger and weaker chick is fiercely put in his/her place through a struggle. Nature. You’re right. Nature is indeed a great teacher in so many ways. I don’t know how to mail you the picture. It doesn’t paste here and I am new to the blogging scene. I love the GB too. Will you post a link to your post on them? Would love to read. And again, you really have a beautiful gift. Brought me a lot of peace today – just looking at your photographs. Thank you! No worries — I’m relatively new to the process myself! If you go to the main page of Serenity Spell, there are pages at the top. Hover on Wildlife, and click on Great Blue Herons… Inside that article, more links will be provided! Thanks so much again; it truly is an utmost and inspiring compliment. Brilliant photographs and congratulations on being ‘freshly pressed’. We don’t have those here in Ireland, just the ordinary plain black blackbirds and the females are not quite as Thrush like and these. I love the call of the redwinged blackbird, it reminds me of childhood because I grew up near an open field. thanks for posting these wonderful photos! Thanks for the lovely pictures and especially for the insight into the female of this species. Red-Winged Blackbirds are among my favorite birds, but you do rarely see the females and — even when you do — you’re often left to wonder if it’s really of the same species. I was especially impressed to see the nest! Great job. You’re so welcome, and many thanks for the kind words! You’re exactly right; for the longest time I passed the females on my hikes, simply because they were so shy and different. We’re fortunate to have protected wetlands with several nesting colonies, making them easier to spot. The nests can be tricky, but wow, to see one in creation is truly amazing — and a spectacular feat of Nature. Goodness, I don’t know how to tell you how stunning these photos are. They leave me nearly breathless. Congrats on FP. I’m one of your fellow’s–also FP yesterday. Pretty crazy, isn’t it? What incredible photos! I live in Brooklyn, New York and the red-winged blackbird is a common sight here in Prospect Park. So interesting that they can flourish in such different environments! I enjoyed this so much! Just this past weekend I was teaching my 7-year-old son what little I know about redwing blackbirds. We see a lot of them at our park, which surrounds a small wetland. I’d love to share this post on my blog, with your permission. You’re starring on my blog now! 🙂 Thank you so much. Thanks for the great photos of the female! I watched a bird in our local marsh off and on for days trying to ID it until it finally occurred to me to check out the Female red-wings markings. You’re so welcome, and many thanks! Isn’t it amazing how different they are from the males of the species? I often strolled right by them myself, on our hikes… They’re so shy, it doesn’t help! Red winged blackbirds are such lovely birds. I love their song! 😍love love love the bird. Last year, I moved from Florida (lived there for 30 years), and don’t have a single nature photo I took during that time that would compare to yours. Quite a talent you’ve developed. Aw, that’s so kind… But I bet that’s not true in the least! People are always hardest on their own work. I love most of what I’ve seen. I wasn’t going to post *any* of my images, until my own family prompted me to do so. We’re our own worst critics (especially those who are artistically-minded, wow!)…. I’ve seen these birds in my backyard! I live in Southwest Florida. I agree with the others, those images are amazing. I have never heard of the Red-winged Blackbird but what a nice surprise with the red. =) Thanks for sharing and you really are an amazing photographer. I grew up in Lompoc California and we had Red Winged Black Birds! I was so jealous of those people back east who had so many colorful birds! 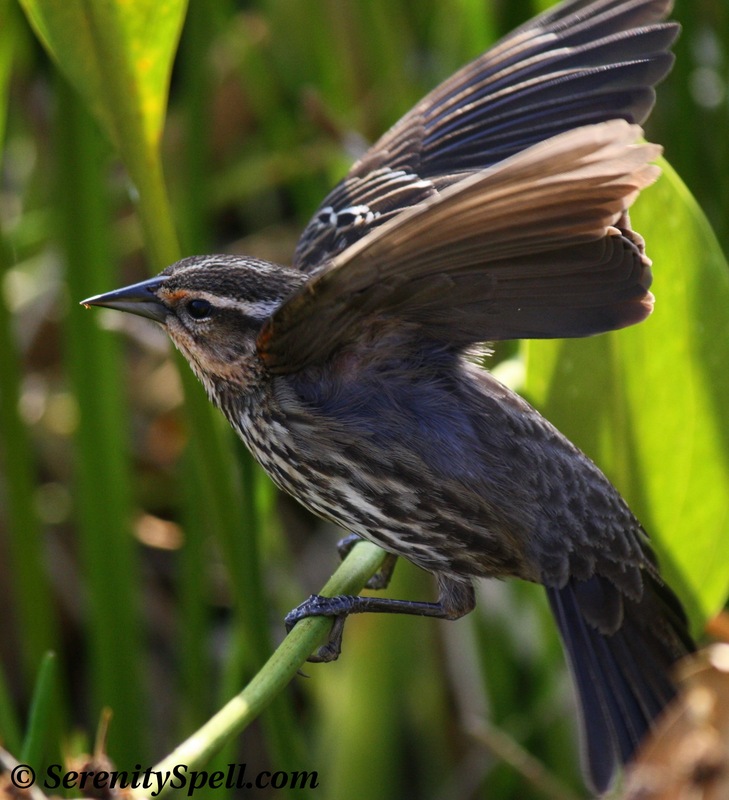 I live in the Pacific North West now and miss the Lovely Red Winged Kings of Lompoc! They are aggressive and also rude. But seeing your pictures of the females is amazing! I lived so close to their habitat and had no idea. They love to be fed bread and whatever seed you have! I was in Lompoc two years ago and was happy to see my childhood friends! My mom has to have a system for feeding. Open front for the crows…then the regular blackbirds and sparrows. In the back the Colorful fruit eaters eat in front of a picture window. AND in the back are the Red Winged Blackbirds! They own the grass, the terrace. The catch the bugs like pros and streak Red across the greens and browns of a temperate climate. A joy much missed! We see many of those here in Toronto near High Park as well as in the Kawarthas at our other home. 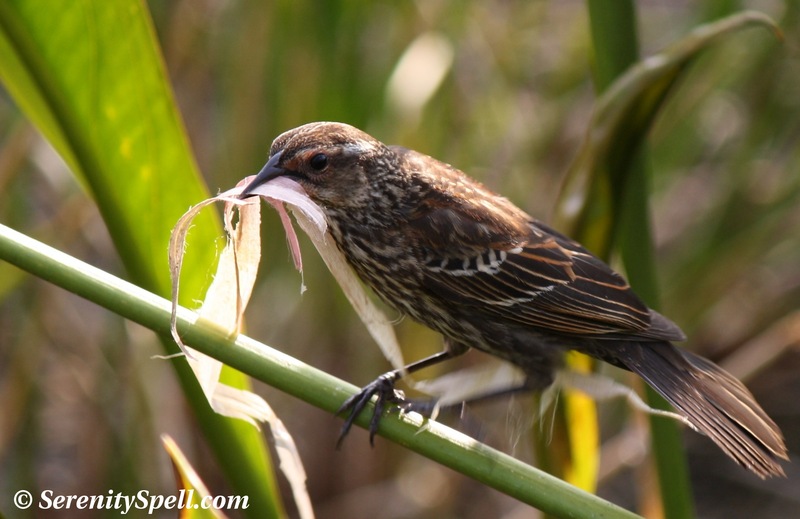 Where there is marsh and cat tails you will see Red Winged Blackbirds! Thanks for sharing. Amazing! I love your blog and photos!!!! I can’t wait to view all your previous posts and the new ones!!! Thanks so very much for following, and reading this chaos!! 🙂 I have a lovely canvas with the Everglades — it’s such a unique ecosystem, totally special. I am sure the everglades are amazing. I have never been but I have snapped shots of the local creatures that visit my yard here in north Houston. I will be sharing those soon! I love red-winged blackbirds, Thanks for sharing! Great, well written story! They are so widespread, and common even in Northern California. I absolutely love their song, and often see/hear them while riding my bike through rural back roads and cattle grazing lands. Thanks. Ah, I adore Northern CA! Have family there, and would love, love, LOVE to live there! Thanks so very much for your kind words + visit… It’s wonderful to listen to their songs, I agree — and it’s great to hear how they live in such radically different environs throughout the continent. I’ve never seen a female Red Wing Black Bird til now. Thank you. I live in Michigan and surprisingly, they were the first birds we saw back this Spring, even before the Robbins! I was so excited- I went out for a walk at lunch by our retention pond, and there was a female, hanging out in the grass! Awesome! Great close-ups. Interesting to see them building nests. The conservation of animal species should be a key part of the environmental policies of countries. Birds, in particular, are susceptible to changes in its ecosystem. 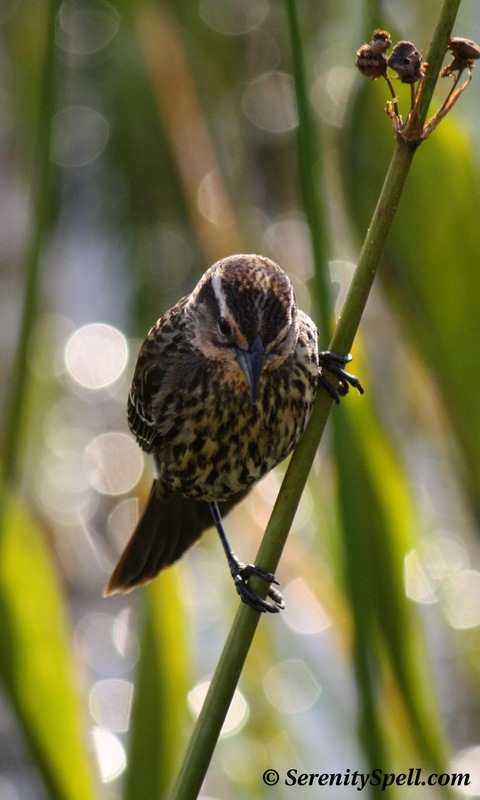 In Costa Rica, for example, populations of birds in Monteverde have decreased considerably due to the growth of the community of Santa Elena and climate change of the place. I totally, thoroughly, wholeheartedly agree with you… On all points. If we can’t care for species that have existed on this planet for tens of millions of years — or more to the point, if we continue to destroy their habitats and diminish their populations with other human ills (poaching, etc.) — we’re going to find ourselves in a none-too-happy situation. I do see more groups organizing and fighting to protect the animals and land, though — I don’t know if it’s my hope, but there seems to have reached a breaking point and/or a general realization in some areas of the world, that change and protection/preservation is simply *needed*. Thanks so much for visiting, and the kind words! Amazing job, the colors are so brilliant, expecially the red of the male, is really powerful! Wow! These are wondeful photographs. I love redwinged blackbirds. They tell us Spring is truly here. Thanks for sharing such a comprehensive and well photographed piece about them. Thanks so very much, for the kind compliments! I love to learn a bit about what I’ve been shooting as well, if I don’t already know — they’re all so amazing and lovely. Red-winged Blackbirds are so cute, I love them, thanks for sharing. Thanks so much — I’m glad you enjoyed them! It’s amazing how so many reconnect with these lovely little songbirds. But wow, that’s such a shame that you don’t see them as much any longer along the Gulf Coast!! Do you know why…? Habitat loss? Human development? How interesting… There has to be a reason, of course. Pesticides? I’m sure environmentalists and scientists would know why their (and other birds’) habitats have been so drastically affected. Like you said — what a shame. Thanks very much — those are the utmost compliments!! I’m so glad I was able to provide a little snapshot into their amazing little lives — I’ve been photographing these lovelies for so long, and haven’t done anything about it. Your choice was my favorite, too… While the males are so intense and spectacularly bright, I fall in love with the females each spring. And when I’m lucky enough to see one building her nest? Wow. They really are the most amazing constructs of Nature — as one fellow blogger put it, “delicacy and strength combined.” I just saw that half-constructed nest last night, and it’s been completely finished, totally perfect. 🙂 One of your fellow Texas natives just commented that he used to see them along the Gulf Coast as a child, but not as much any longer…. Red Winged Blackbird was my mom’s favorite bird. There are so many in the lakes and waterways near Denver – I loved to take walks with mom and listen for their call! 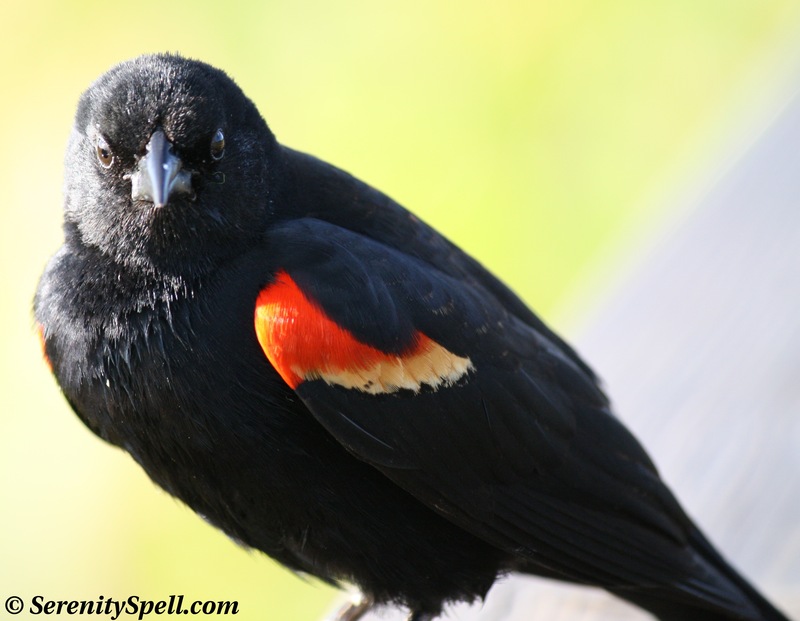 The Red Winged Blackbird was my mom’s favorite bird – sometimes I think her spirit speaks to me when I hear their call! I love the photos in this post – such intimate portraits of the birds! WoW! Brilliant pictures. They are so beautifully taken. Congratulations on being freshly pressed. Thanks so very much! What a *wonderful* concept, a children’s rhyming book on birds! It’s amazing how many people identify with these little lovelies. 🙂 Much luck on your book!! Wow – these shots really are amazing and beautiful. These are beautiful pictures! I love listening to those birds in my backyard. I love your pages! Always an education done beautifully. Today I learned about the Mrs. Quite a pretty bird on her own. I’ve seen many males, but never knew about the females. And the nests are clever with delightfully designed eggs. Almost like artwork — change that — they ARE artwork. Great stuff. This is informative. 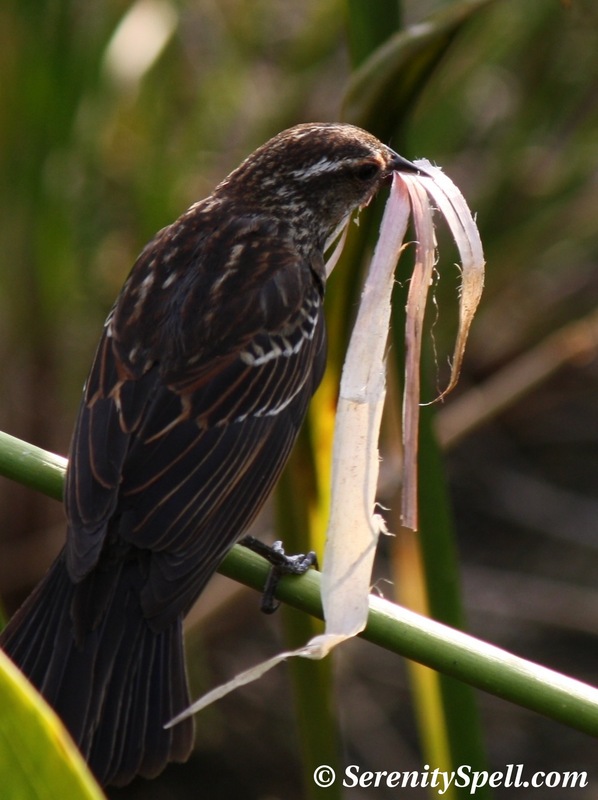 I have encountered red-winged blackbirds in marshy areas of western Washington (State), but I have known little about the birds. I read a memoir once, can’t remember the name of the author or the book, about a New Yorker’s relationship with a particular red-winged blackbird in Central Park. I’m so glad you found this useful! We’re surrounded by these little lovelies here in South Florida, with the wetlands, swamps, and Everglades, so I had to give them their appropriate due. 🙂 I love to hear them when I’m out-and-about, and seeing the males’ bright spots of color. I’ll have to keep an eye out for this book — I’ve never heard of it! Thanks so much! I love these bright and lovely little songbirds. It’s hard not to focus on them when I visit our local wetlands — they’re such a prominent (and vocal) part of the scenery. Such a fabulous post that truly deserved being fresh-pressed. Your photos are so spectacular, that I have nothing but bird photo envy every time I look at one of your captures. Who needs a fancy lens when you have become a master already! Aw, you’re SO incredibly kind!!! Incredibly lucky here, to be surrounded by such fantastic opportunities and models — and now that the worst of the heat is breaking….? Hoorah! Next time you’re down, you must visit the rookeries!! I live in Schertz TX and saw a strange looking bird. The bird had a black head wings and tail with a small yellow spott on the tip of its tail. The wings had the red and yellow strip and when it opened up its wings it had a lot of red but the back was like a female and colored like a sparrow anyone know what that may be. Hmmmm… I’m sorry, I can’t help you! Doesn’t sound like a critter in our area. I know that there’s a bird photog in the Texas area, though — he may have more info! If I stumble across his info, I’ll send it to you. You have a beautiful blog. I shared the Audubon photos on facebook. I hope you don’t mind if I do this again. LOVE these birdies!! They are amazing! Aren’t they the sweetest? I missed them this year… The babies, that is. I was so sad! Beautiful photographs and loved your narrative too. Thank you so very much! It was a treat to witness, and learn about them — such amazing creatures! And their nests are beautiful creations. 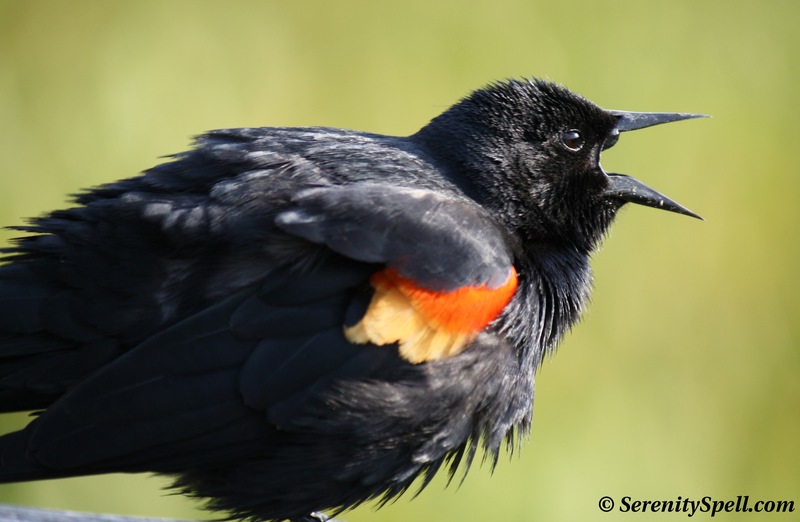 Have you ever read about the red-winged blackbird George in Central Park, Manhattan? I read a book about a man’s discovery of red-winged blackbirds and his special bird, George. I can’t recall the name of the book or the author, but I remember George. It looks like I’m viewing your post again–a deja vu experience! Your photos are amazing. I’ve never been able to get photos of the red-wing blackbird though I have tried. They’re often hidden from sight at the marsh I visit. I can definitely hear their signature call though. Thank you! I learned so much from these sweet, lovely birds – they’re such amazing, brave little creatures. And their nests? Intricate masterpieces.